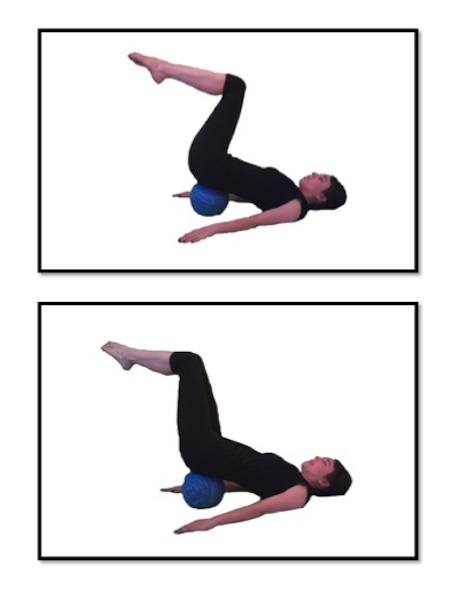 This exercise is intended to increase the difficulty of this oblique abdominal exercise by adding proprioceptive challenge. To do this exercise you will need a mat and a soft ball. Start by lying on your back with the soft ball underneath your pelvis. Your legs should be in a tabletop position. Inhale as you point your legs to the side and then exhale as you lower your toes to the floor and bring them back. Inhale as you point the toes to the other side and then exhale as you tap our toes on the ground. Repeat alternating sides 8-10 times. Remember with these oblique variations that you are rotating the thighs in the hip sockets while maintaining stillness in the pelvis. Your pelvis may want to roll to one side or the waist may shorten because your hip hikes towards the ribcage. Be sure to use your exhale to engage your pelvis floor and lower abdominals. Sometimes it helps to think of the abdomen pulling away from the leg as it lowers.